Delicious and effective meal replacement shakes – Celebrity Slim ACTIVE can be consumed at any time during the Celebrity Slim Programme. Like all of our meal replacement products the ACTIVE Shakes are based on a high protein formula, fortified with vitamins and minerals to support your energy levels. The main difference is that ACTIVE Shakes are designed to be mixed with skimmed milk, rather than water. If you enjoy exercise then why not try our ACTIVE Phase. Designed to kick-start your weight loss* the ACTIVE Phase combines exercise with Celebrity Slim ACTIVE meal replacements. Simply consume 3 ACTIVE Shakes, spaced through the day, along with a balanced meal and importantly, 2 litres of water, and add 20-30 minute moderate exercise to your daily routine. The ACTIVE Phase is great way to start your diet for a week or two before moving on to the TRIM Phase. Find out more about the ACTIVE Phase in the About the Programme section. Simply add cool, skimmed milk, shake and enjoy! Each 840g tub contains 21 x 40g servings – enough for three shakes for 7 days on the ACTIVE Phase. Directions of use: Add 200ml of skimmed milk to a shaker along with 2 level scoops (40g) of shake powder and shake vigorously for 30 seconds. Active Phase: Enjoy three Active Shakes each day along with a balanced meal. TRIM Phase: Enjoy 2 Active Shakes each day along with a balanced meal and 3 allowable snacks. It is important to maintain an adequate daily fluid intake when using this product. It is important to follow these directions. 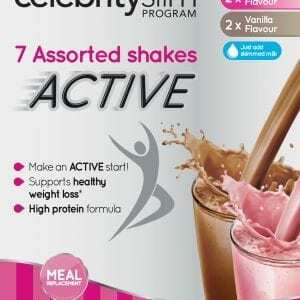 Typical Nutritional Information for Celebrity Slim Active flavoured shake.